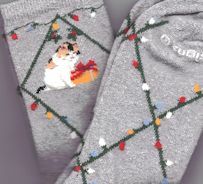 These light grey socks feature a calico cat looking down at a gift. Christmas lights weave throughout the design. The socks are 75% cotton, 20% nylon, 5% spandex. Made in the USA they fit adult size 9 - 11.